Is sea level rise entering the mainstream? Mid-August is never a great time for activity on the climate front, particularly not in holiday bound Europe. Perhaps the “highlight” of the week was the leak of a late draft of the upcoming Summary for Policymakers of the IPCC WG1 5th Assessment Report. The formal release is near the end of September, but the leak has caused quite a stir. Most mainstream media have reported on at least one aspect of the draft document, in almost all cases highlighting that the temperature rise seen over the last 100 years is “extremely likely” caused (at least more than half of it) by the release of CO2 into the atmosphere from the use of fossil fuels by humans. This is a more certain statement than has been made in the past by IPCC. There is very high confidence that the maximum global mean sea level was at least 5 m higher than present and high confidence that it did not exceed 10 m above present during the last interglacial period (129,000 to 116,000 years ago), when the global mean surface temperature was, with medium confidence, not more than 2°C warmer than pre-industrial. This sea level is higher than reported in AR4 owing to more widespread and comprehensive paleoclimate reconstructions. During the last interglacial period, the Greenland ice sheet very likely contributed between 1.4 and 4.3 m sea level equivalent, implying with medium confidence a contribution from the Antarctic ice sheet to the global mean sea level. National Geographic also picked up on sea level in their September issue, with a cover feature and a comprehensive set of charts, graphs and videos (for the iPad version) as only National Geographic can do. 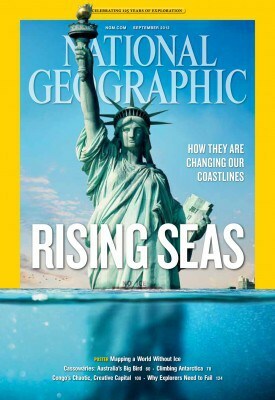 Unfortunately the cover has already come in for criticism from one blog site in particular, arguing that NatGeo is scaremongering as it will take thousands of years for sea level to rise to that level (about 60 metres) on the Statue of Liberty. In fairness, the magazine does point this out in the article where it has a graphic showing what the coast would look like if all the ice sheets melted (i.e. both Antarctica and Greenland over several thousand years). There is no assertion by NatGeo that this will happen, it’s just a graphic to give readers some idea of the full scope of the sea level issue. All of this raises the possibility that sea level rise may become the eventual poster-child for climate change. While floods, droughts, storms, heat waves and forest fires all have the “wrath of God” feel to them, they are unpredictable, uncertain and have always been with us. No single event can be attributed to anything other than a chaotic system and a complex statistical analysis over a long period of time is required to make the case that a change is underway. This makes it very difficult to use these events to gain public appreciation of the climate risk and therefore build any consensus around a suitable course of action. As is now also apparent, global surface temperature itself is not that reliable either and the alternative of trying to get mainstream understanding of a global heat imbalance (oceans, air , ice etc.) is probably just too difficult. But sea level just keeps rising! 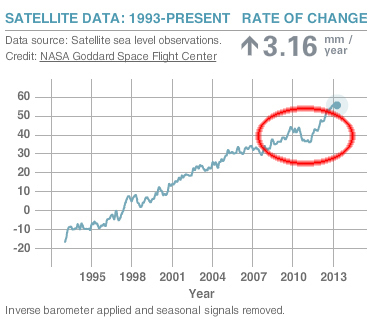 All that being said, an observer of the NASA web site on climate indicators will note that sea level took a remarkable dip and recovery over the last two years. Apparently this is due to very heavy and widespread rain in Australia over that period. The continent acts like a basin and “traps” the water to some extent, at least for a while until evaporation and drainage eventually do their job. Extraordinary! This is no news, however, it feels like we are getting closer to it. I don’t see it happening during my generation, but future generations will have to face a raising sea level unless something drastic is done and somehow we slow down the rate in which we are doing damage to the environment. I am looking forward to reading National Geographic’s issue about this matter and then I will have a better understanding of what appears to be an almost certain future.